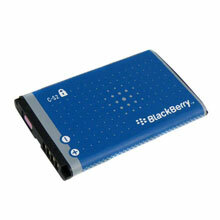 An authentic RIM BlackBerry C-S2 lithium rechargeable battery. Always handy to have a spare! battery is ideally suited for use with the external battery charger (also available from this site). With that particular charging system, you insert the spare battery into the independent charging unit which plugs directly into a wall socket. Thus you always have a fully-charged spare battery to hand, and don't need to tie up your handheld device whilst charging :-).